Establishing India’s NewSpace Ecosystem to Capitalize a Major Space Economy – Finding the investors, their advice/insights. NewSpace is starting to brew in India. Space startups are doing everything from sending a rover to the Moon to claim the Google Lunar XPrize, building a satellite constellation in Low Earth Orbit (LEO) to provide internet from space to rural India, providing crop risk management and for making agriculture predictable and profitable. The question is how is this different from what the government is already doing with the space agency Indian Space Research Organsiation (ISRO)? The answer is simply trying to do what NewSpace stands for. Building independent B2B, B2C solutions leveraging space/satellites as medium/tools to provide services. Of course, this is an ecosystem that is being supported by the presence of a vendor base, manpower base that has a combined experience of dealing with space for the past five decades. The immediate question is if the opportunity is big? Here is some classical management jargon where I want to say yes, there is an opportunity, but only If we work together to build a sustainable ecosystem. What makes the opportunity unique? Having been the space sector for the past decade I simply have come to the conclusion that SIZE REALLY MATTERS, unlike boutique and high-worth-micro-markets! Here is an example of NewSpace can make a difference for India (given the size and scale). Despite having 375 million internet users, has the challenging task of connecting the other 70% of the country’s population, a majority of which resides in semi-urban and rural areas. The cost to cover a square kilometer for space solutions vary between $3 to $6 as compared to ground solutions that incur at least $3000 to cover the same area using cable and towers. The standard modes of service, using underground optical cables or improving mobile network coverage, are not the best options to bridge this gap IF WE WILL LEAP FROG TO DIGITAL INDIA. Connecting the unconnected in India is an unprecedented opportunity for NewSpace in India. This brings me to the premise of the article, establishing India’s NewSpace ecosystem to capitalize and scale a major space economy. 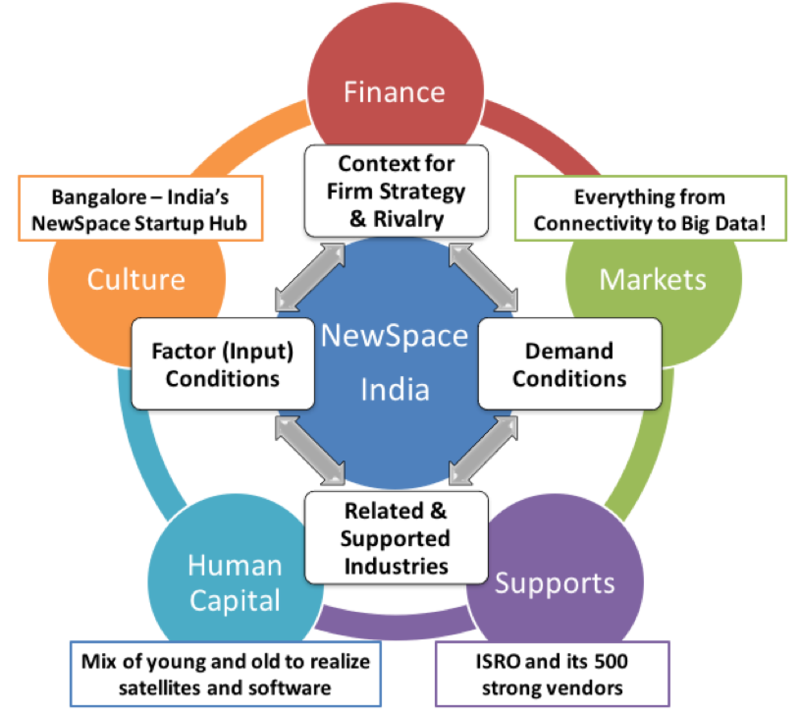 NewSpace in India is in its infancy compared to that of other parts of the world. I believe there has been no major institutional financing that NewSpace has received so far. Most of the financing for NewSpace has happened through either high-net-worth individuals or allied industry veterans who connect to the opportunity. The question is why are institutional investors not really enthusiastically investing in NewSpace in India? From my experience of pitching to some of them, I believe their qualms are regarding the quantum of investment needed for a startup in the space sector to surface, the longer-return horizon, the lack of a very clear roadmap to exit/positive liquidation scenarios. These are true for the profile of the space/aerospace industry itself since the product/service lifecycle of space based services/products are not as light speed as say the IT sector. The other key area of concern may be the lack of a concrete regulatory environment for private space/NewSpace in India. There is still no complete clarity on how critical requirements such as licensing of spacecraft, frequency, export of data, etc., will be authorized by Department of Space. However, none of these arguments have anything to do with the opportunity itself. Alongside my startup enthusiasm, I am on a quest to evolve the NewSpace ecosystem in India towards maturity in both financing and regulations. To this end, I welcome suggestions/comments with on a focus on mechanisms to stimulate growth and investment; identification, mitigation and removal of regulatory barriers to growth are also important in this context from your local/international experiences that can help us grow the NewSpace ecosystem in India. As a part of these efforts, we are planning for a panel on ‘NewSpace Financing’ at the Observer Research Foundation (ORF) Annual Space Dialogue in Delhi between Feb 16-18, 2017 (http://www.orfonline.org/kcspacedialogue/). We would love to have investors to share their experiences of such investments and exits in NewSpace. This will also provide an opportunity for investors to review NewSpace opportunities in India. Please reach out if to us if you can help us connect with NewSpace investors in your network to this end.